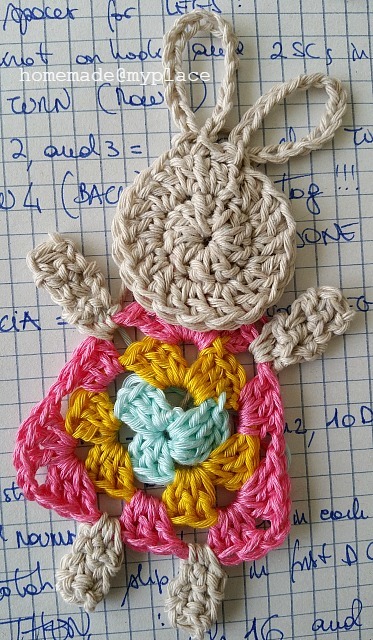 It seems I`m not able (or can`t find the time) to be here more regurarly, and I`m sorry for that, as I really love this place of mine... anyway, I made another pattern to share with you all! 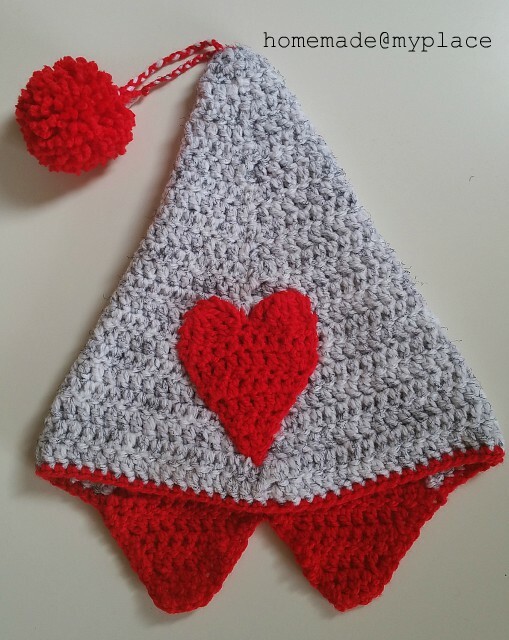 The idea came to me last year, while working on triangle motifs to figure out a simple heart.. this came out very elongated and I decided to use it for a silly hat, good for both Valentine`s Day and the italian Carnevale, at the end of February...!!! This ridiculous hat is a very quick make and I like the fact it doesn`t need to be stiffened to hold its point up!!! 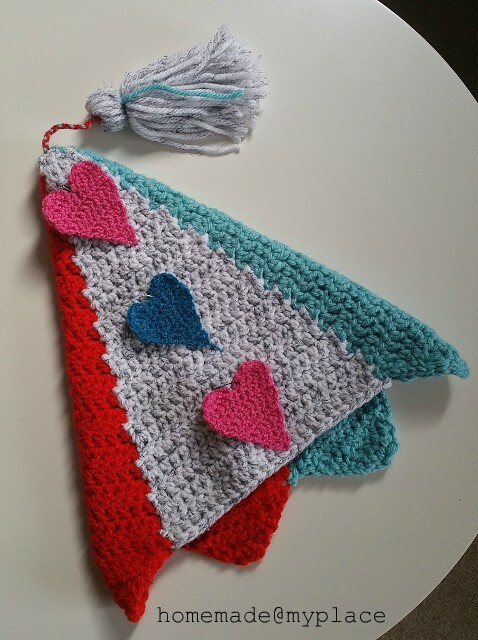 The hat is made of 3 panels (1 upside-down heart and 2 triangles), worked using DC (= British tr) stitches and joined as you go (no sewing involved). The upside-down heart is kept on the back of your head when wearing the hat, as you can see from the above picture : there is a kind of tail along my neck on the left selfie of my collage ! Please note that I`m following the US crochet terminology. My turning chain (2ch) is never considered as a proper stitch. 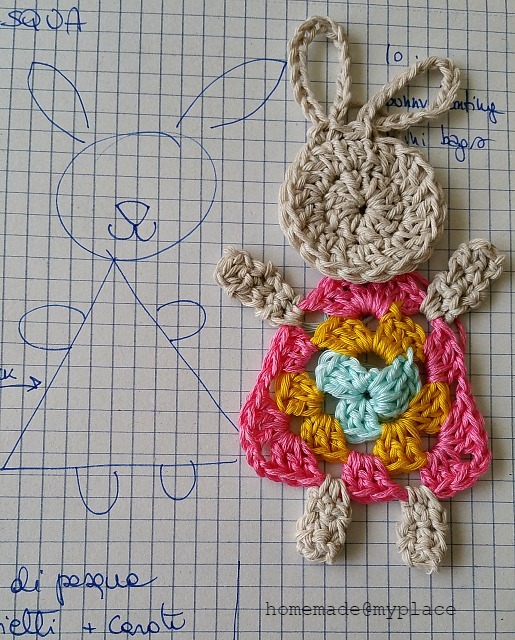 The pattern is intended for intermediate crocheters. 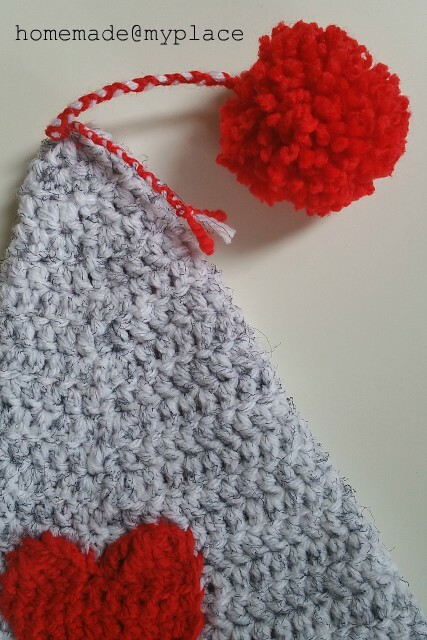 Make a slip knot on your hook with the red yarn and ch 3. Row 3 : 4 DC, 2ch, TURN. Row 5 : 6 DC, 2ch, TURN. Row 7 : 8 DC, 2ch, TURN. Row 9 : 10 DC, 2ch, TURN. Row 11 : 12 DC, 2ch, TURN. Row 13 : 14 DC, 2ch, TURN. Row 15 : 16 DC, 2ch, TURN. Row 17 : 18 DC, 2ch, TURN. Row 19 : 20 DC, 2ch, TURN. Row 21 : 22 DC, 2ch, TURN. Row 23 (RS) : 24 DC, 2ch, TURN. 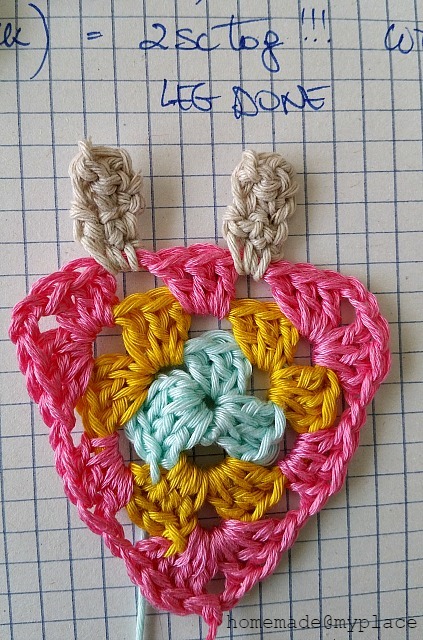 Starting on the WS, repeat the same pattern for the other curved side of the heart. Different colours, but right picture!!! 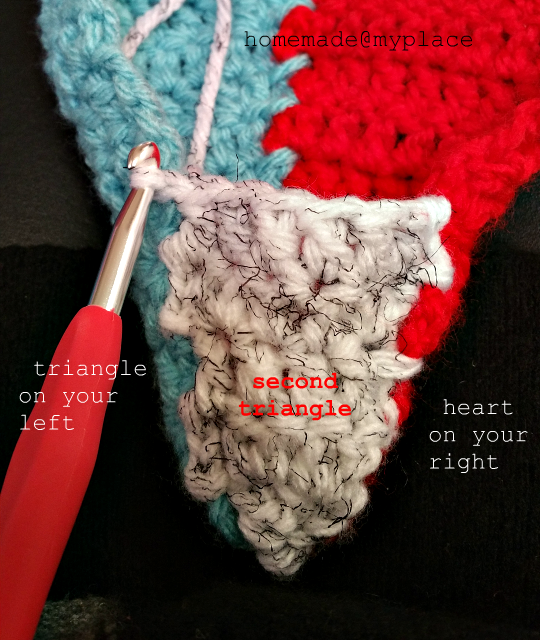 We are going to follow the same pattern for the first part of the heart panel, but the triangle is joined as you go to the previous panel ! The joinings are highlighted in bold and they happen only at the end of each odd row. 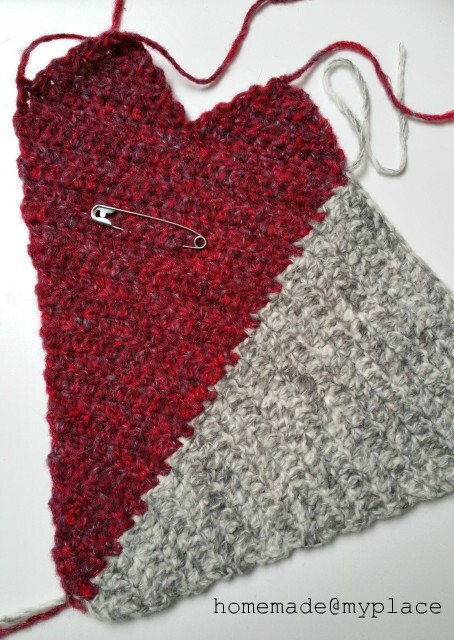 Pick up the heart panel (you can put a stitch marker on the front of it) with the RS facing you. Each time you will join the new one to it, the heart panel will be at the left of the working panel. Insert the hook (from front to back) in the bottom point of the heart and join the new colour (stormcloud), then chain 3. Row 3 : 4 DC, sl st in top of 1st DC of row 3 of heart, 2ch, sl st into top of 1st DC of row 5 of heart, TURN. Row 5 : 6 DC, sl st in top of 1st DC of row 5 of heart, 2ch, sl st into top of 1st DC of row 6 of heart, TURN. Row 7 : 8 DC, sl st in top of 1st DC of row 7 of heart, 2ch, sl st into top of 1st DC of row 8 of heart, TURN. Row 9 : 10 DC, sl st in top of 1st DC of row 9 of heart, 2ch, sl st into top of 1st DC of row 10 of heart, TURN. Row 11 : 12 DC, sl st in top of 1st DC of row 11 of heart, 2ch, sl st into top of 1st DC of row 12 of heart, TURN. 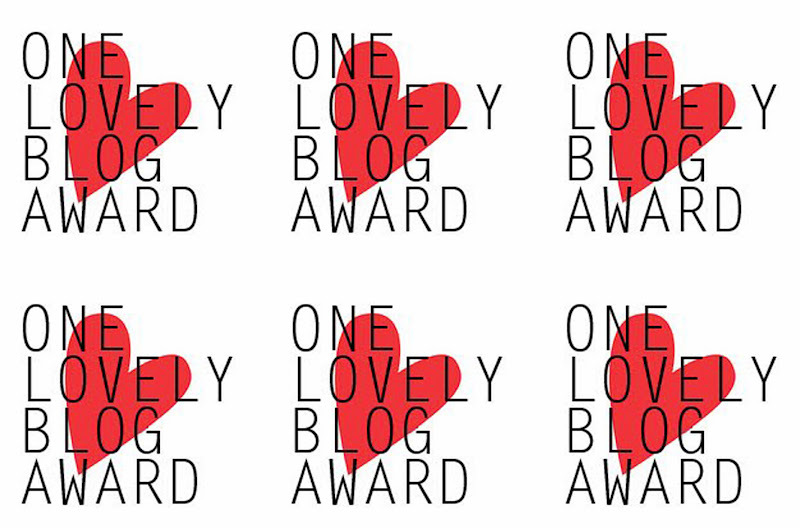 Row 13 : 14 DC, sl st in top of 1st DC of row 13 of heart, 2ch, sl st into top of 1st DC of row 14 of heart, TURN. Row 15 : 16 DC, sl st in top of 1st DC of row 15 of heart, 2ch, sl st into top of 1st DC of row 16 of heart, TURN. Row 17 : 18 DC, sl st in top of 1st DC of row 17 of heart, 2ch, sl st into top of 1st DC of row 18 of heart, TURN. Row 19 : 20 DC, sl st in top of 1st DC of row 19 of heart, 2ch, sl st into top of 1st DC of row 20 of heart, TURN. Row 21 : 22 DC, sl st in top of 1st DC of row 21 of heart, 2ch, sl st into top of 1st DC of row 22 of heart, TURN. Row 23 (RS) : 24 DC, sl st in top of 1st DC of row 23 of heart, F.O. Even this time there is some joining.... more than the previous one! In fact, this new panel is worked joining it to both previous panels !!! In this way you avoid any sewing and when completed you have a hat!!! The joinings are highlighted in bold and they happen at the end of each row, only on the RS of the work! This time, the heart will be at your right, while the first triangle will be at your left. 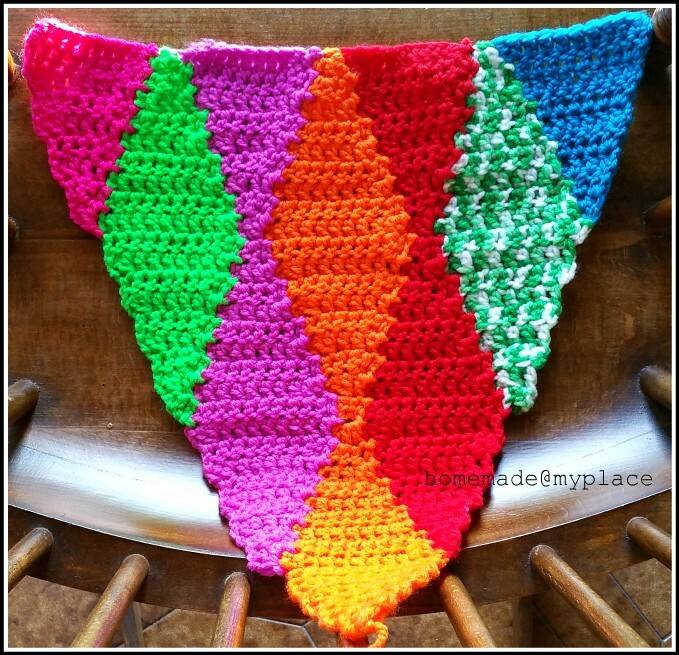 Insert the hook (from front to back) in the bottom point of the triangle and join the colour stormcloud, then chain 3. Row 3 : 4 DC, sl st in top of 1st DC of row 3 of triangle, 2ch, sl st into top of 1st DC of row 5 of triangle, TURN. Row 5 : 6 DC, sl st in top of 1st DC of row 5 of triangle, 2ch, sl st into top of 1st DC of row 6 of triangle, TURN. Row 7 : 8 DC, sl st in top of 1st DC of row 7 of triangle, 2ch, sl st into top of 1st DC of row 8 of triangle, TURN. Row 11 : 12 DC, sl st in top of 1st DC of row 11 of triangle, 2ch, sl st into top of 1st DC of row 12 of triangle, TURN. Row 13 : 14 DC, sl st in top of 1st DC of row 13 of triangle, 2ch, sl st into top of 1st DC of row 14 of triangle, TURN. Row 15 : 16 DC, sl st in top of 1st DC of row 15 of triangle, 2ch, sl st into top of 1st DC of row 16 of triangle, TURN. Row 17 : 18 DC, sl st in top of 1st DC of row 17 of triangle, 2ch, sl st into top of 1st DC of row 18 of triangle, TURN. Row 19 : 20 DC, sl st in top of 1st DC of row 19 of triangle, 2ch, sl st into top of 1st DC of row 20 of triangle, TURN. Row 21 : 22 DC, sl st in top of 1st DC of row 21 of triangle, 2ch, sl st into top of 1st DC of row 22 of triangle, TURN. If your hat is made of 2 triangles and 1 heart, once done, it will be like the one on the bottom left of the above picture. The upside-down heart is the back of the heart. 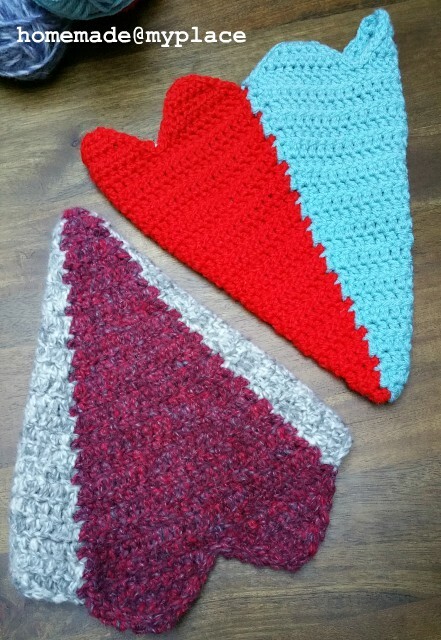 If you decide, instead, to work a hat with 2 hearts and 1 triangle, the back/sides will be like the one in the top right of the picture. In this case, the 2 hearts will cover your neck and ears! Just to give a neat finish to your hat! 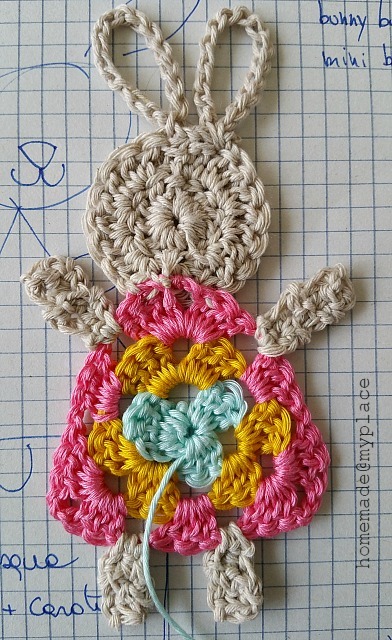 Make a slip knot on your hook with red yarn and work a round of SC (dc), starting the start of right curve of the heart. To close the round, simply sl st in top of first SC made. Trim in all ends. With red yarn, make a slip knot on hook and work 3 chains. Row 7 (RS) : 5Trtog, cut yarn and fasten off; join yarn in next stitch and 3ch in same stitch and work 5Trtog. Cut yarn and fasten off. Weave in ends! Put it on the front of your hat and sew it on! Wrap 80 (more or less) times the red yarn around your fingers. Slide it off and knot another red lenght of yarn around it. Trim the excess of yarn and attach the pom-pom at the top of your hat, letting it dangle a little bit ! 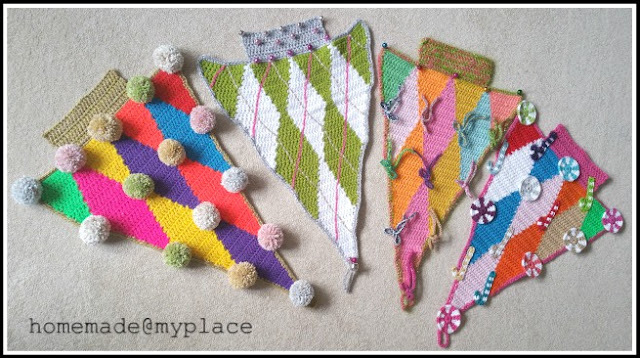 ... As usual : if you try to crochet one hat or more, please let me know! to my name ! I would really appreciate that!!! Make it ! Diamonds Christmas Tree !!! ...Well, it has been a while since my last post, right ? 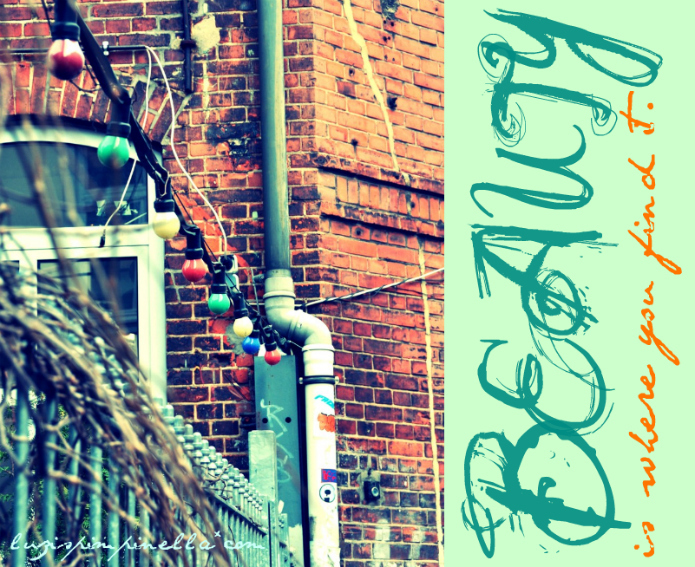 I`ve been missing this place a lot and I hope to be here regurarly from now on, hoping you love the idea, too !!! 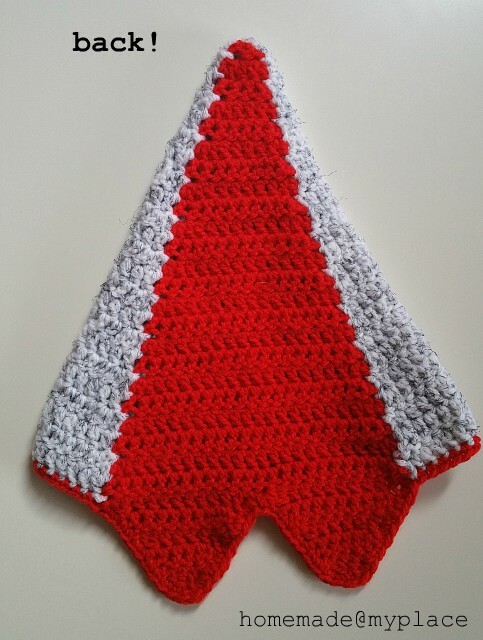 So December is here again and I love this time of the year very much and that`s why I have a pattern to show you my last christmassy idea... are you ready to follow me? 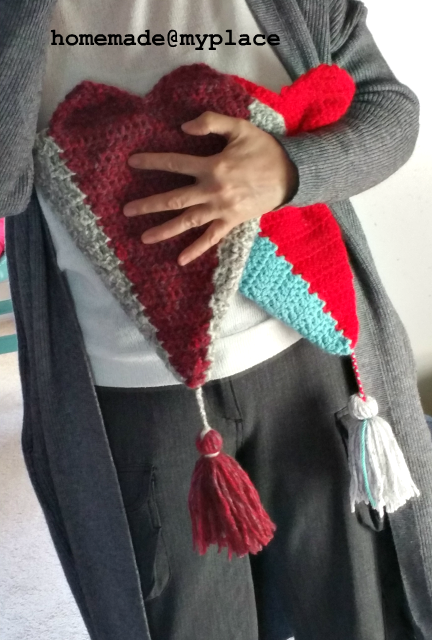 YARN : it`s all from my personal stash. 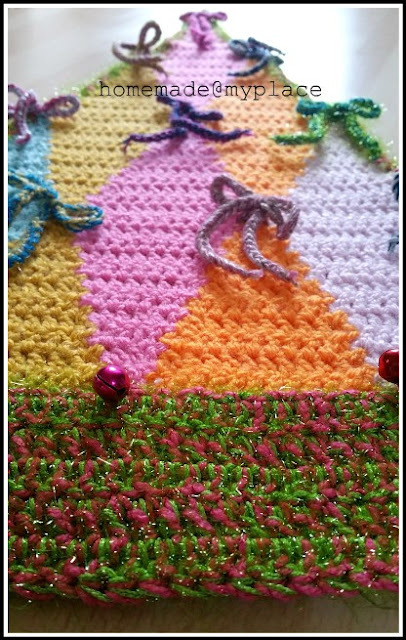 I`m using a selection of Simply Aran from Paintbox Yarns (the Diamonds part), some Sirdar no 1 for the embellishments (pompoms, candies), and some metallic options (Hayfield Bonus Glitter, Sparkle Glamourus Yarn from B&M, etc). I will try to more specific later in the pattern writing. 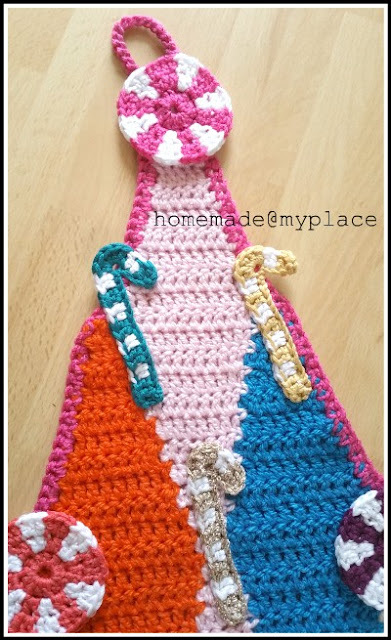 Please, remember I follow the US crochet terminology !! 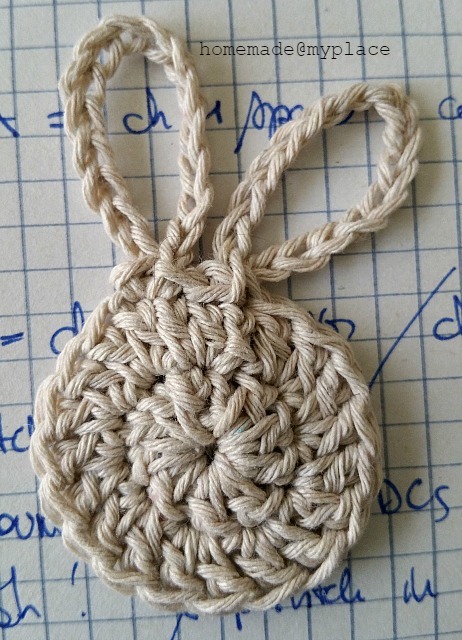 My turning chain (=2ch) is never considered as a proper stitch. As you can see from the above picture, the tree is made of diamond motifs. 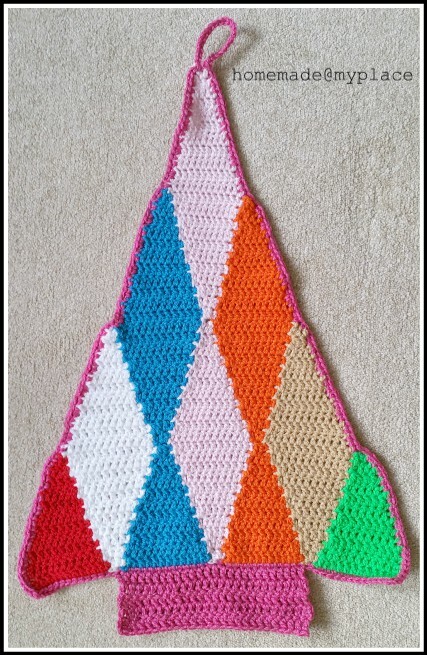 The pattern starts with the triangle on the bottom left and ends with the triangle at the bottom right. In the between, you work vertical strips of motifs, joined one after the other with a sort of "Join-As-You-Go" method. 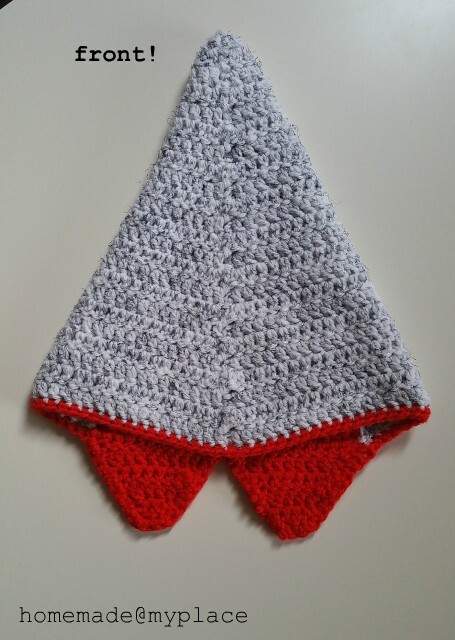 The joining itself is made using slip stitches and it`s well explained in the pattern. In this way, no sewing is involved. You can use a maximum of 7 different shades. 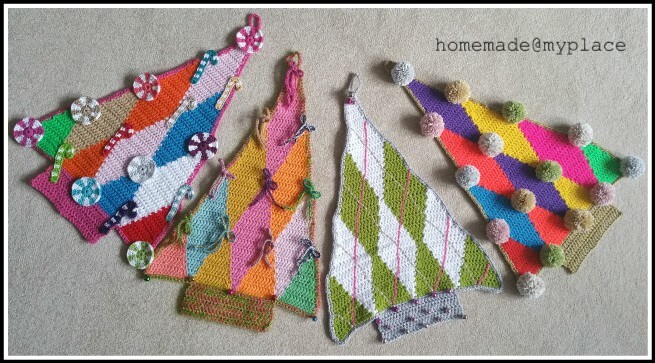 The above 4 triangles are crocheted using a 5mm hook and a selection of Simply Aran Paintbox Yarns . 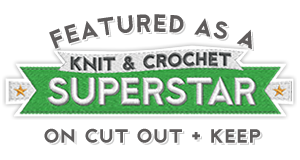 Obviously, you can use any substitute from your personal yarn stash. 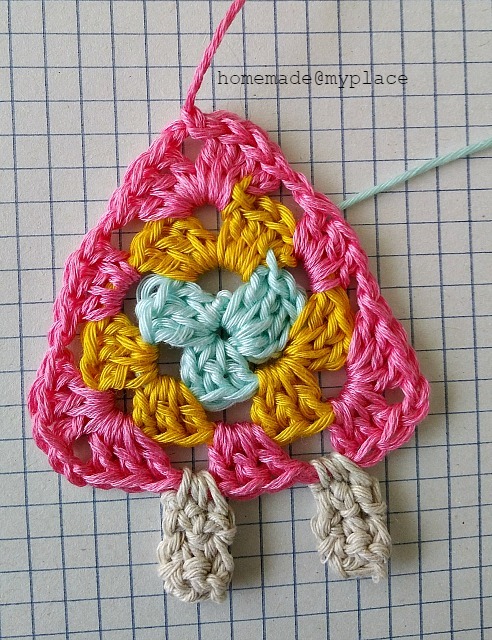 Choose a starting colour, make a slip knot on your hook and work a foundation chain of 14 chains. Your first triangle (and so your 1st strip!) is done. 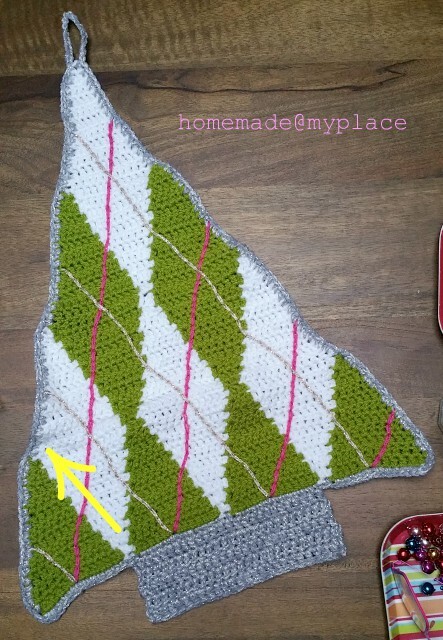 Insert tip of your hook in base of 1st DC of Row 1 of previous triangle (T1) and make a slip stich to join new yarn, then work 3ch. Your first diamond is done, so it`s your 2nd strip. 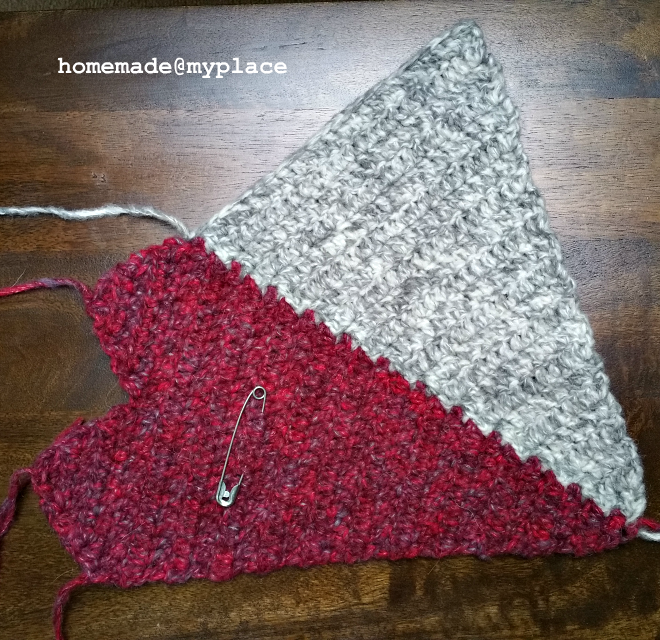 Insert tip of your hook in base of 1st DC of Row 1 of previous diamond (D2) and make a slip stich to join new yarn, then work 14 ch. 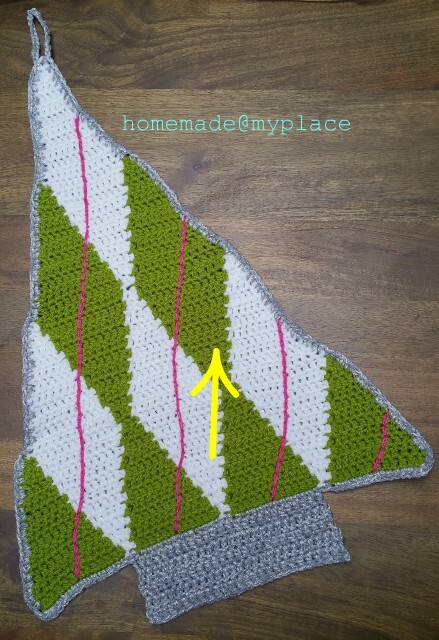 Insert tip of your hook in base of 1st DC of Row 1 of previous triangle (D3) and make a slip stich to join new yarn, then work 3ch. 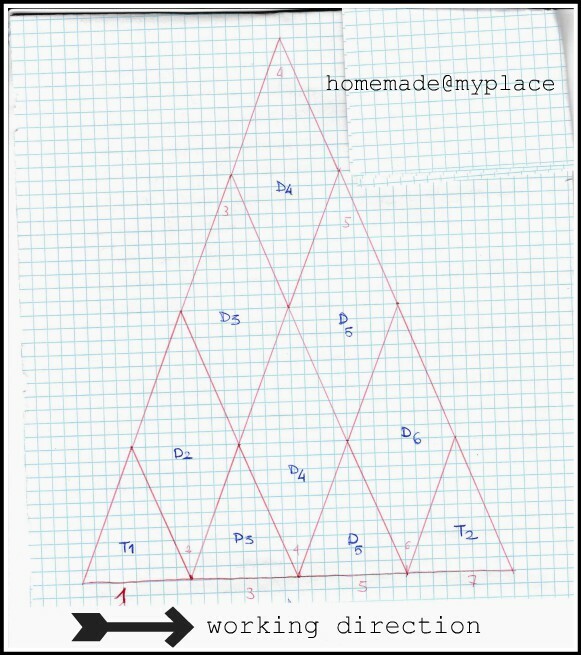 Same pattern as for D3, with the difference that you have to join from Row 23 to Row 33 to the correspondent rows of D4. 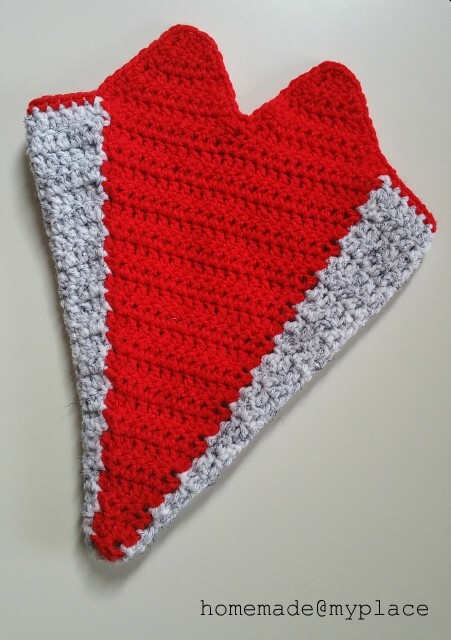 Same pattern as for D2, but you need to join from Row 12 to Row 22 to the corresponding rows of D5. Weave in all ends ! Using a selection of metallic yarns (Hayfield Bonus Glitter, Sparkle Glamorous Yarn, and some others!!) I did a simple edging around the tree and I added a trunk, too. 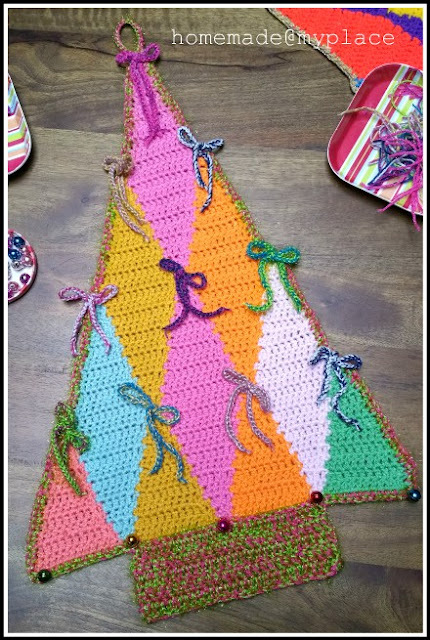 Working with 2 threads together and a 5mm hook, you need to keep the RS of the tree facing you, but upside-down, so you start to crochet from its bottom. Make a slip knot on your hook and insert the tip of 1st diamond on the right (see above picture, yellow arrow) and work your first SC. 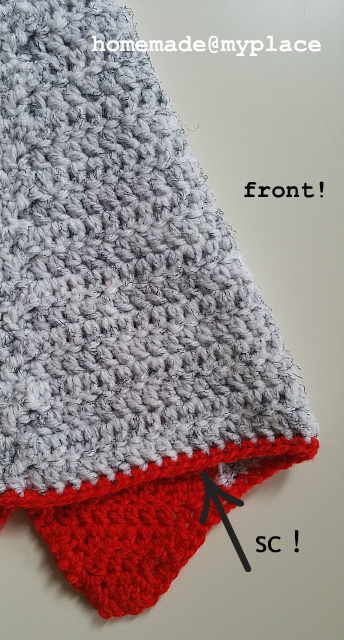 When you reach the 1st SC of the edging, complete the border with a slip stitch and work 2ch. 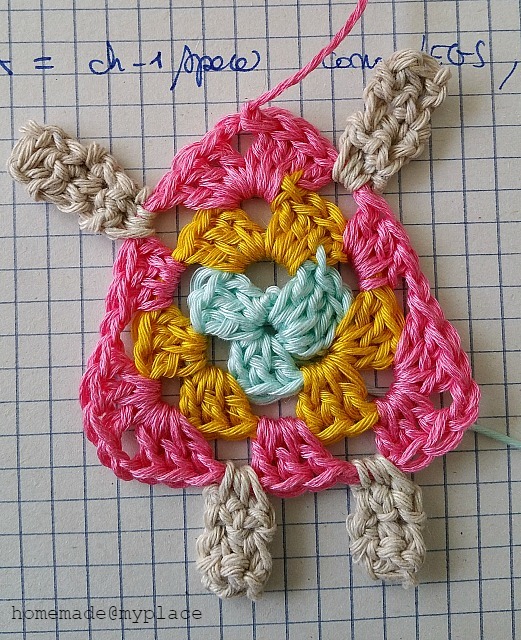 In the next 25 stitches work one DC in each one, 2ch, Turn. Repeat other 4 times (so you will a total of 5 rows) to have a small tree trunk. Fasten off. 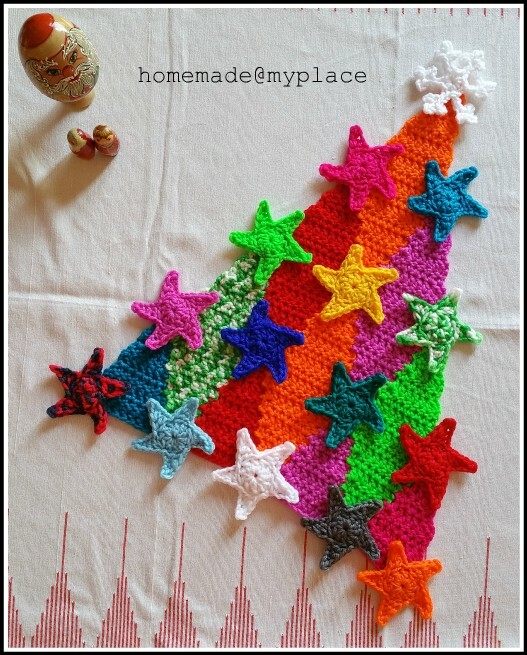 You need to pin your tree, with WS facing you, on a blocking board or foam tiles. 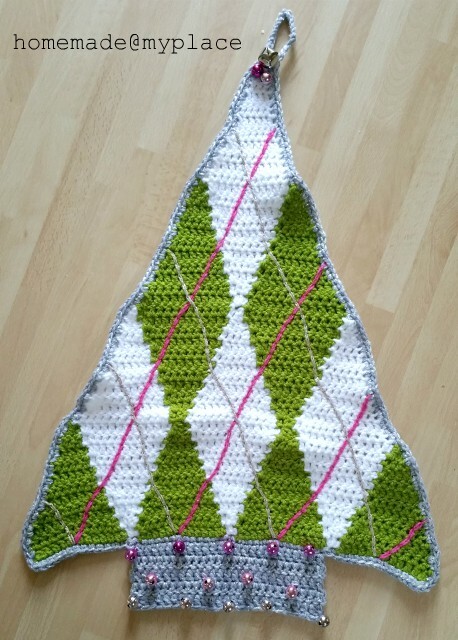 The only tree it`s better to block later, after the embellishments. is the Argyle tree! Prepare a solution of tap water and PVA glue in equal parts to brush on the back of the tree in order to stiffen it. 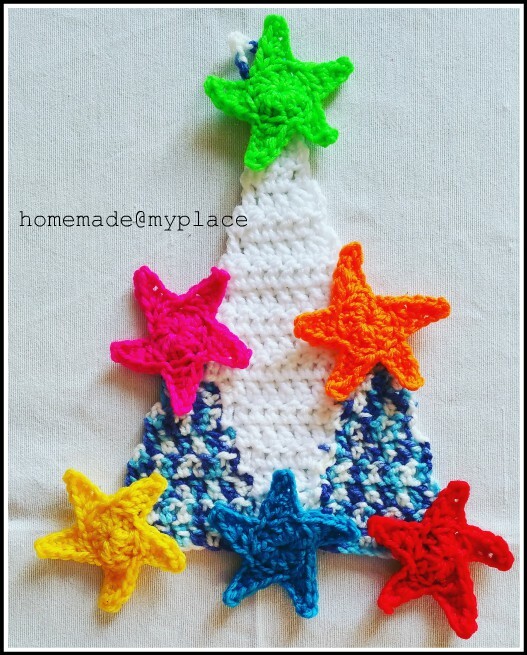 Once ready, you can start to decorate it! 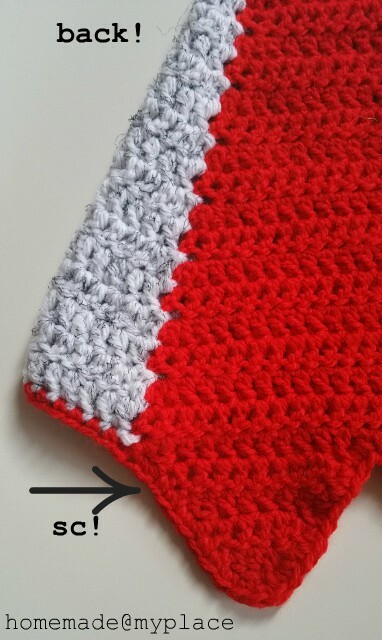 You have to select a couple of contrasting colours from the metallic yarns and with the help of a 4mm hook you just have to work slip stitches to create the argyle effect, first one colour in one direction, then the other colour in the opposite direction. 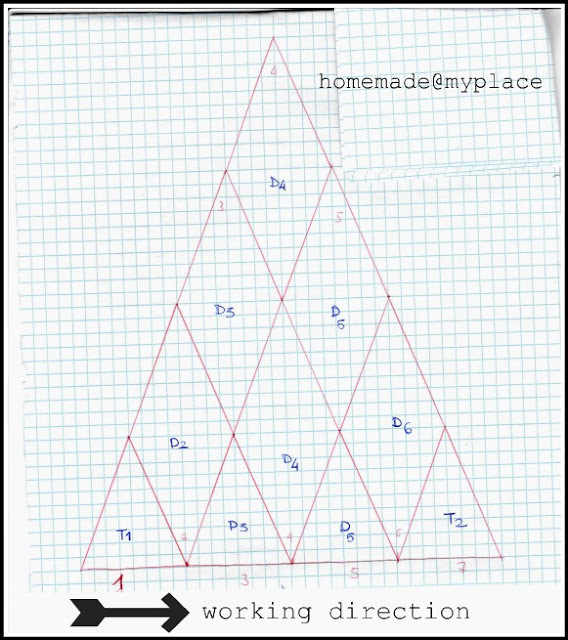 Starting from the middle bottom of each triangle, you have to draw lines almost parallel (!!!) to the sides of the diamond motifs.... it seems scary and impossible, but believe me it is not ! 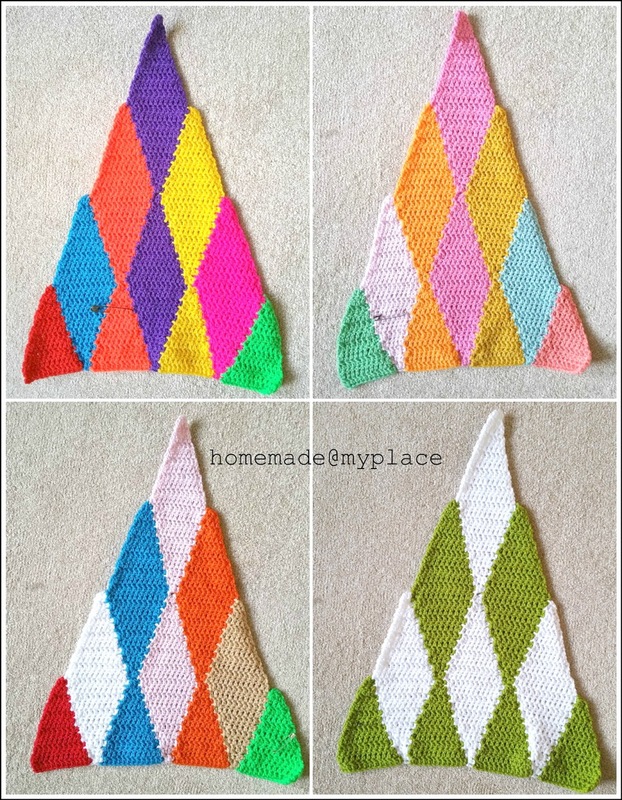 Once the Argyle design is completed, you can block your tre and when it`s dry, you can add some colourful bells, too! Each bow is a chain made of 70 chains, worked with 2 strands, and knotted into the front of the tree. 4 bells are added to embellish the bottom. 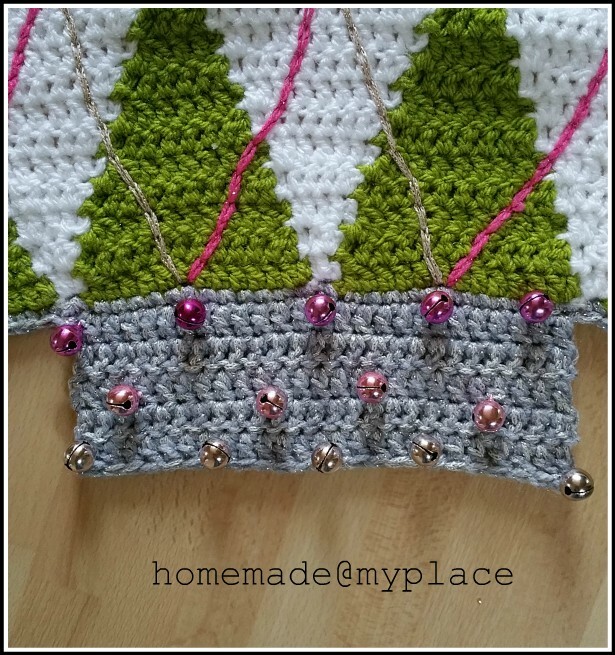 Using the 45mm Clover pompom maker and a strand of metallic yarn together with a strand of Sirdar no 1 , prepare 15 pompoms to knot to the front of the tree. Very easy, but so effective! 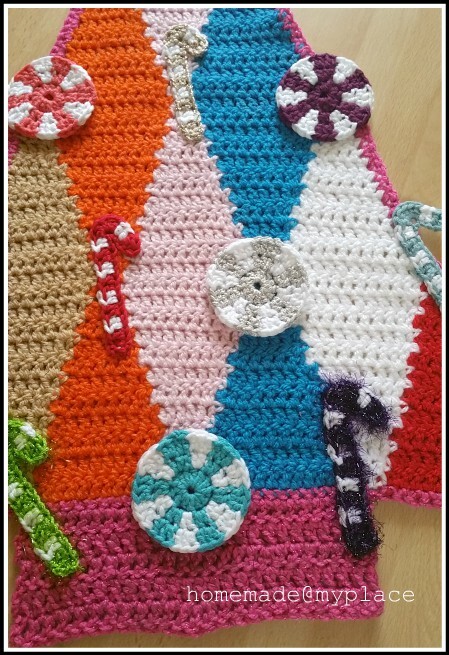 ....luckily I already wrote a pattern for these candies a while ago !!! You can find the instructions right HERE !!! 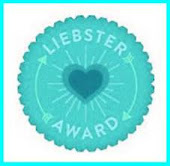 Obviously you can decide to embellish (or not!) your tree with other ideas : as you know very well, the sky is the limit!!! 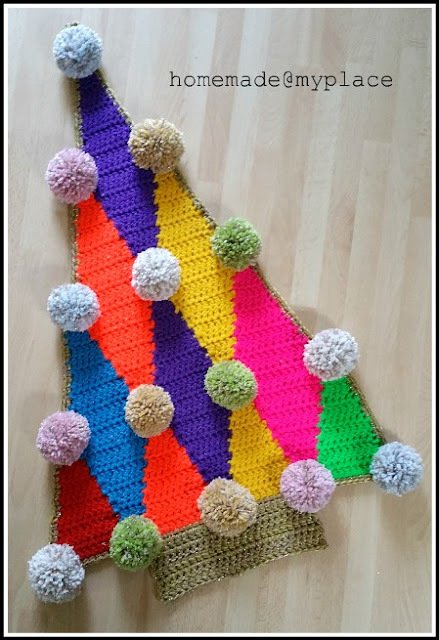 Anyhow, I`m curious to know who remembers the original idea for this pattern??? 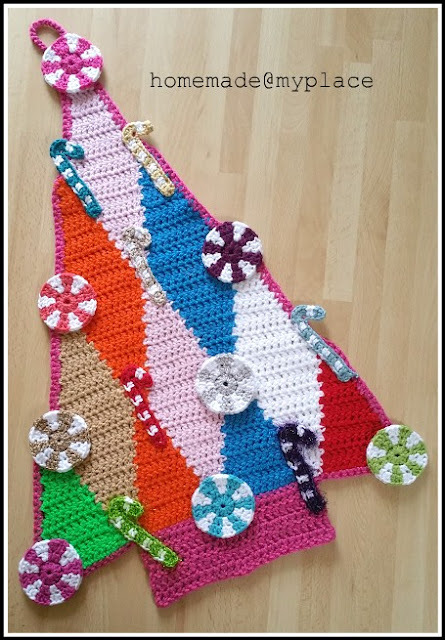 Please, let me know if you are crocheting a tree or two....thank you !!! 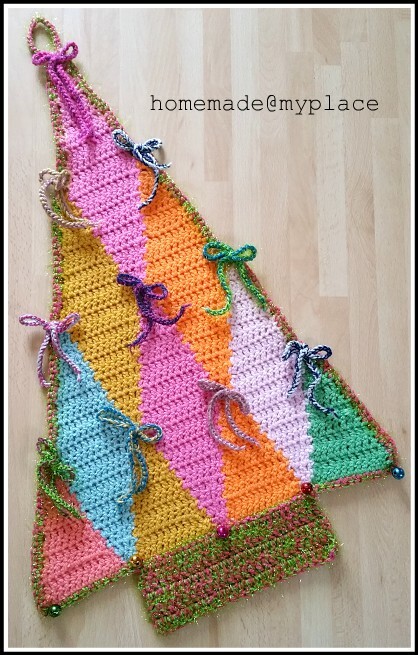 ... and a colourful crocheter named Karin @woolfieber, made her own version just looking at my pic (you can find her work HERE ) !!!! My idea, since the beginning , was to prepare a photo tutorial for you, but do you really need one ? 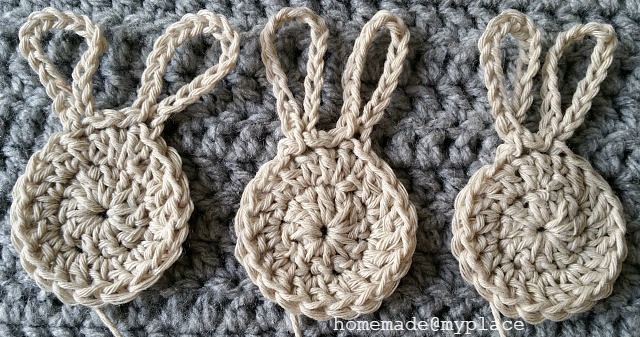 These Granny Bunnies are so easy to crochet, believe me !!!! 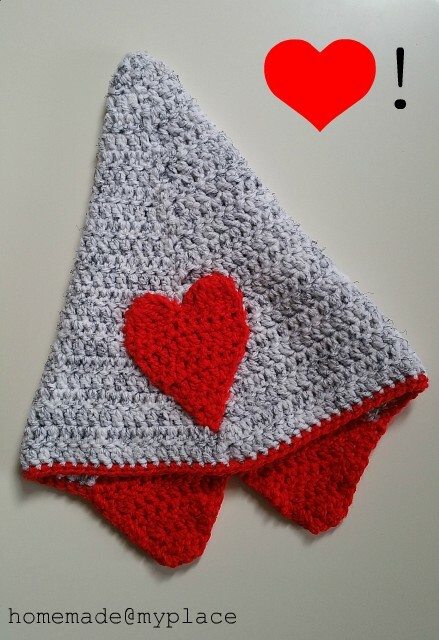 Please note that I follow the US crochet terminology, thank you ! 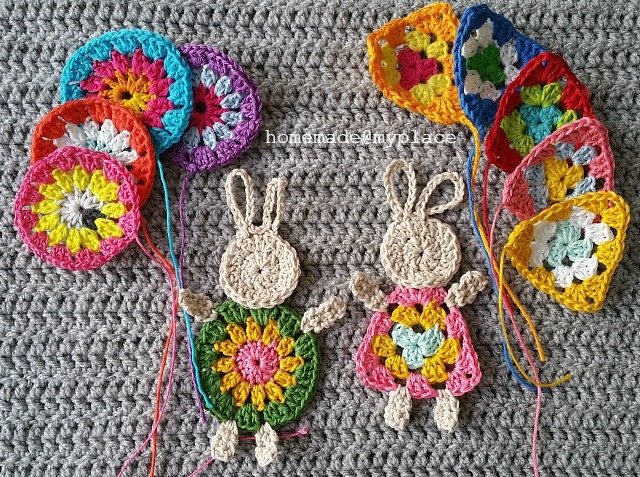 Each bunny measures 13 cm in height and it can be used for different purposes : bunting, hanging decorations, appliques, brooches, on napkin rings and more !!!! The sky's the limit !!! make a slip knot on your hook with the chosen colour. 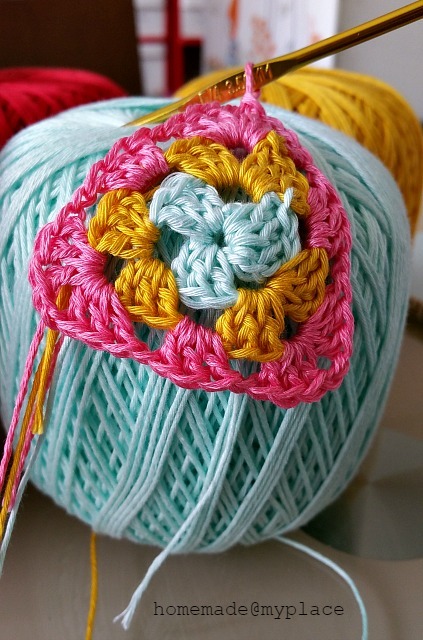 Chain 4 and slip stitch in first chain to form a ring. 1st round : chain 2, [3 DCs into ring + ch 2] 3 times. 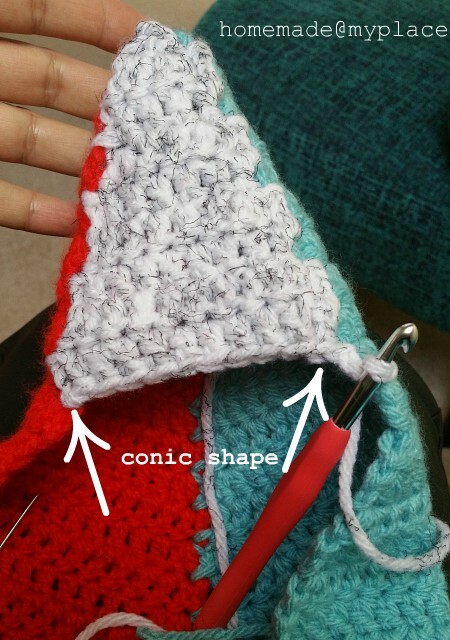 Slip stitch in top of first DC and in following 2 DCs and corner. Cut yarn and fasten off. 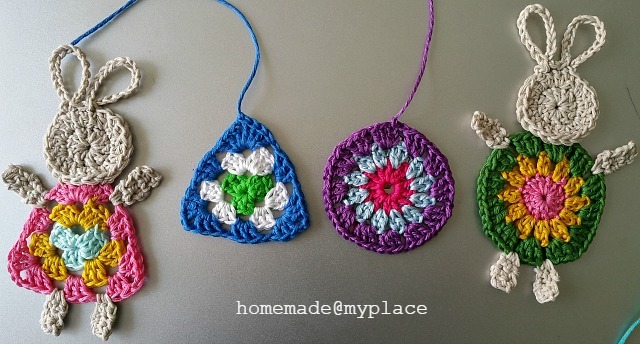 2nd round : join new colour in corner and chain 2, then [3 DCS, ch 2, 3 DCS in same corner + ch 1] 3 times. Slip stitch in top of first DC and following 2 DCs and corner. Cut yarn and fasten off. 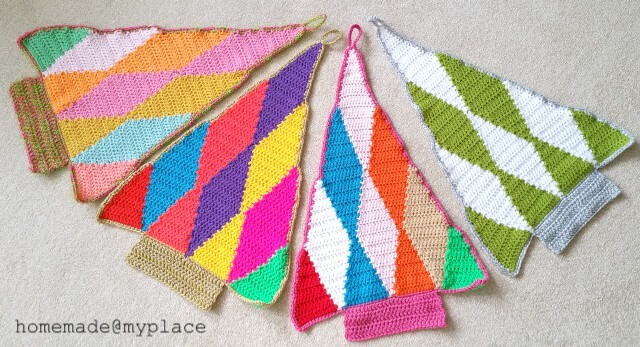 3rd round : join new colour in corner and chain 2, then [(3 DCs, ch 2, 3 DCs in same corner + ch 1) + (3 DCs + ch 1)] 3 times. Slip stitch in top of first DC, cut yarn and fasten off. Let's start with the legs ! 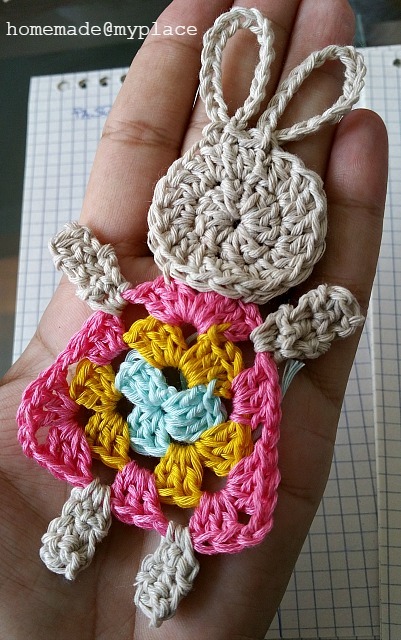 Choose any colour for your bunny, as it can be any hue you prefer, ok ? Make a slip knot on your hook and insert the tip in the first chain-1 space on the right. Repeat the same pattern for the other leg in next chain-1 space !!! Now we can add the arms !!! 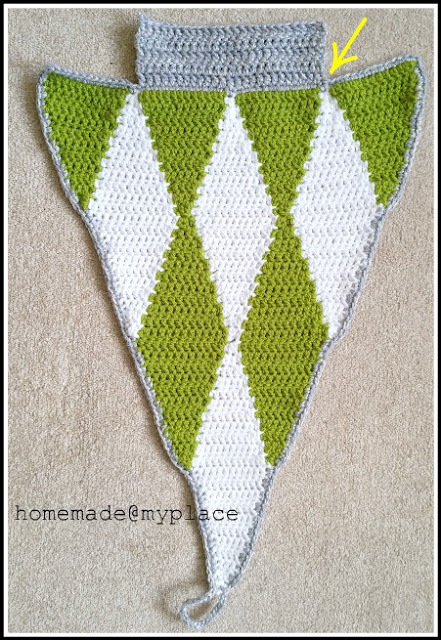 This time you have to work into the chain-1 spaces close to the top corner of the triangle and repeat the pattern used for the legs, but with an extra row ! With the same colour, make a slip knot on your hook and insert the tip in one of the chain-1 spaces (right or left). 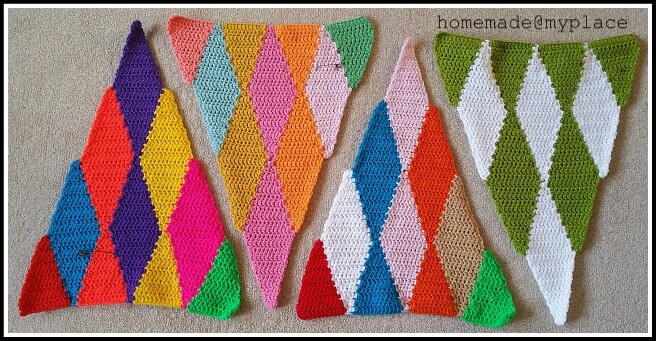 Repeat the same pattern for the other arm in opposite chain-1 space !!! 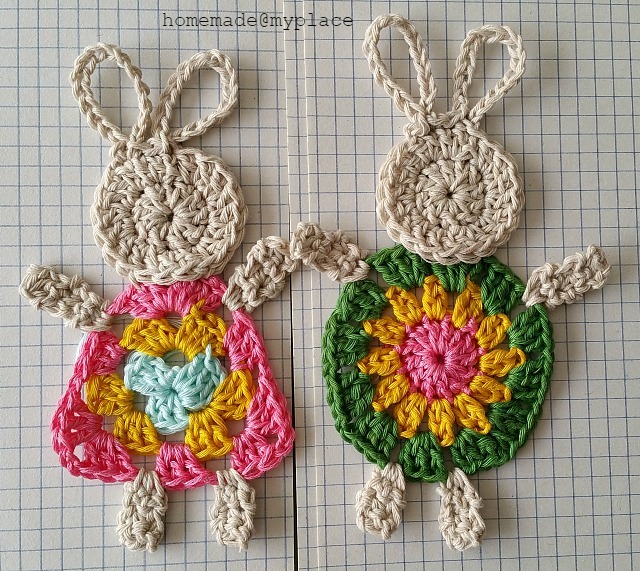 You have to repeat the above patterns even for the bunny with the "granny circle body". 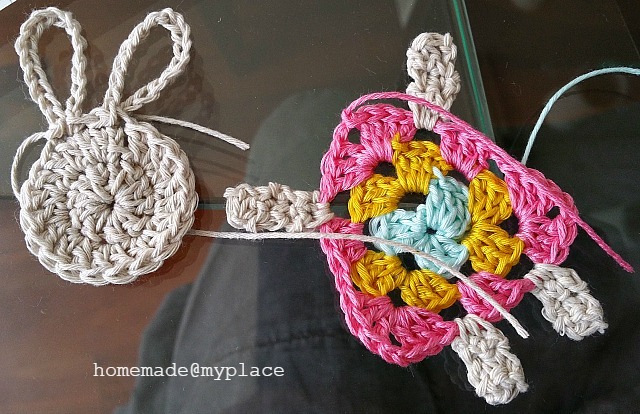 The only difference between the two bodies is which chain-1 space to consider to crochet in arms and legs. With the same colour used for the limbs, make a slip knot on your hook, chain 4 and slip stitch in first chain to form a ring. 3rd round : chain 16, slip stitch in first chain made, then slip stitch in next stitch of the round, chain 16, slip stitch in first chain, slip stitch in next stitch of the round, cut yarn and fasten off. With the help of few stitches, stitch the head on the top of the body/bodies !!! 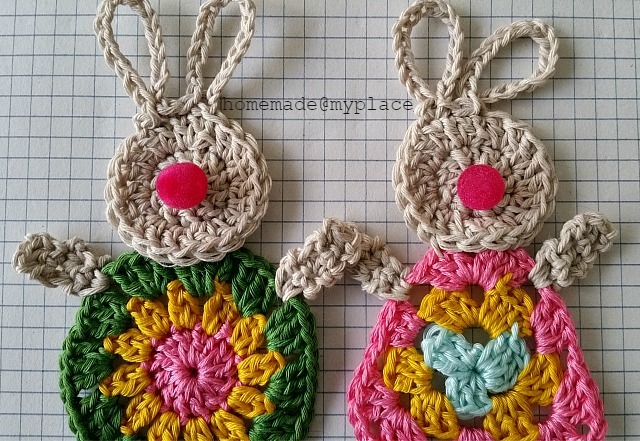 You have to crochet loads of bunnies, just to play with shapes and colours !!! 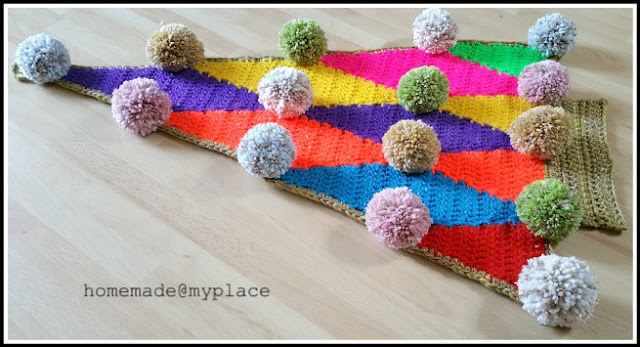 If you like you can add a pompom tail on the back, too !!!! ... well, I'm curious to see your bunnies, now !!! 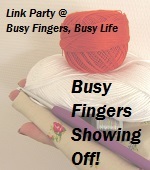 If you like to play with more patterns and photo tutorials, just have a look at this PAGE !!!! Ali Maravillas entrevista a... Poetryarn! Mega Granny Square Jumper !! !